We have just extended coverage of our ITO Map overlay map service to most of the USA and Canada and all the Caribbean islands (ie all of the USA except Hawaii and Alaska and all of Canada except the northern wilderness). Read more on the ITO Map wiki page and in the earlier announcement accompanying the release for the UK and parts of Europe. Users of the existing European service may notice that we have reduced the maximum zoom level for 8 to 10 for some scripts and increased it from 11 to 10 for some others. Further expansion of the service will come by the end of next week. This first screenshot highlights lakes, rivers and ferry routes in British Columbia (lakes in light blue, rivers in dark blue, coastline in green, canals using tan and ferries in read). Click on any of these screenshots to open the browser for the given views. Keys are provided for all overlays in the bottom left corner of the map. Clicking on the key takes one to further details on the OSM wiki. 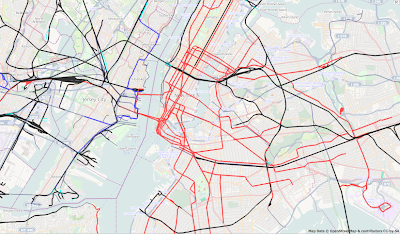 This next view is of railways in New York (Mainline services are in black, underground rail in red and light rail in blue). 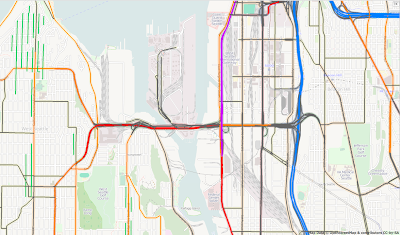 This next one is for speed limits in Seattle (lowest speeds are green, higher speeds in purple and blue). Full details in the key. 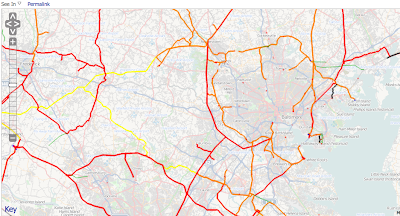 And finally electricity distribution around Baltimore with sub stations in red, power distribution in various colours according to voltage and black where no voltage is specified. these are really helpful, hope to see more of this. one note -- the speed limit visualizer doesn't appear to recognize 25 mph, which is not uncommon in the US. in fact, you should probably be checking ranges as there are some odd speed limits in some parts of the US. i know of one road in Durham, NC which has a posted limit of 27 mph. It should be displaying 25 mph correctly. Do check for odd capitalisation, for additional spaces or other variations given that our parsed is very fussy. Re speed ranges, yes - we will do that in time but again our parser is not able to do that yet. If you still can't see what is wrong then please can you provide a link to the road that is not being displayed correctly. i'm now thinking it may be an update issue. i only recently change the road from 40 (no units, default kph) to 25 mph. how frequently are the views updated? the key doesn't include 25 mph which is why i assumed otherwise at first. As a rule we present information from two days ago, ie on Sunday we present information from Friday midnight. We intend to reduce this delay over time. Thank you for pointing out the issue with the key which I have now corrected.